This stove is ex-shop display, unused and BRAND NEW. 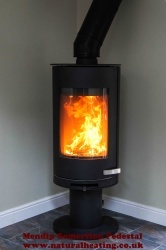 Somerton II is an elegant cylindrical convection wood stove. The smooth fitted rounded door has a multi-point locking system with a single form stainless steel curved handle. The Somerton II range features the precise new universal air controller with its simple single point lever which also gives a closed combustion capability. All models have a bespoke cast ion grate and large ash pan to give extended emptying times and have three independent air supplies ensuring more complete combustion in the firebox resulting in a cleaner burn. Photo Somerton Pedestal from Eurostove Ltd on Vimeo.